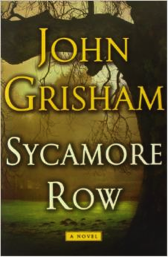 With Sycamore Row, Grisham is at the top of his game. A patiently constructed novel, Sycamore Row is populated with multilayered characters involved in deep moral and legal conflicts along intertwining storylines that culminate in a dramatic final verdict. This is not a violent page-turner or a fast-moving action suspense, such as The firm or other Grisham novels, but a fully developed legal drama with deep roots in the good old South. Sycamore Row picks up where Grisham’s very first novel left off. A Time to Kill (1988) was famously written by Grisham when he was still a young attorney, who rose up at dawn to put in an hour or two of writing before starting his lawyerly day. The result was a story that combined complex legal, moral and human issues seamlessly, a novel many considered to be Grisham’s best book. Sycamore Row does justice to its prequel as it delivers equivalent intensity within a similar social unease in the context of whites and blacks facing injustice, adjudication and redemption. Attorney Jack Brigance is back with the new case, almost as unpopular as the Hailey murder case in A Time to Kill. In Sycamore Row, he is tasked with defending the handwritten will of the wealthiest citizen of Ford County, Seth Hubbard, who killed himself after a long battle with cancer. The handwritten will cancels an earlier will, prepared by a prestigious law firm, that left his fortune to his children and grandchildren. The last minute, handwritten will bequeaths the bulk of Hubbard’s fortune to his black maid. The ensuing battle brings onto Grisham’s wide canvas a large number of characters, including the unlikely heiress and her many family members, the disinherited family of the deceased, and many lawyers representing various parties and interests. We’re back at the Clanton courthouse before Judge Atlee, where the scars from last year’s Hailey trial have not yet healed. Grisham is very good at weaving social issues into legal and human conflicts. In Sycamore Row, he does it again with issues of wealth and racism in the context of southern white-black history. The large cast of characters might be hard to follow throughout the long story, but the main players are well-developed and as alive and human as the characters in A Time to Kill. Sycamore Row takes us on a detailed journey, from the moment of the suicide through the discovery of the various legal documents and shocking facts (before and during the trial). The story leads to a satisfying conclusion that ties up closely with the painful and shameful past of injustice (and worse) in the deep South, going back all the way to the era that followed actual slavery with crimes no less horrendous. In summary, for lovers of legal drama and trial fiction, Sycamore Road is as good as it gets. For astute readers, some surprises may not be wholly surprising, and to readers with professional legal background, some courtroom developments might seem unrealistic. But this is no more than nitpicking because, in all fairness, a real-life trial transcript will never make for an exciting novel, which must move along without getting stuck in the mind-numbing mud of legal humdrum. With Sycamore Row, John Grisham keeps up the pace, builds up the suspense, and makes us think hard and feel deeply while we turn the pages. True to the reputation he has built since A Time To Kill, Grisham is at the top of his game.